As we slide into September I begin my lament of all the summer foods I will soon miss. Sure I look forward to the first crisp apples of Fall, but oh, the berries, the peaches, how I will miss them. That's why this Labor Day I decided to give summer fruit a proper send off. 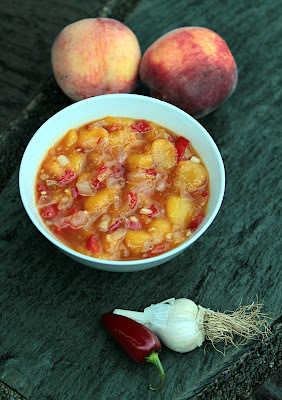 This chutney was inspired by a batch of wonderfully fragrant and juicy peaches from the farmer's market. I wanted a sweet, yet savory side dish for a package of our pork CSA sausages. This chutney would work equally well for any cut of pork as well as lamb or poultry. In a medium sauce pan heat the vinegar and honey. Stirring until the honey is fully dissolved. Toss in the onion, garlic, bell pepper, hot pepper and ginger. Bring to a simmer, stirring occasionally. Let it simmer for 10 minutes. Add in the peaches. 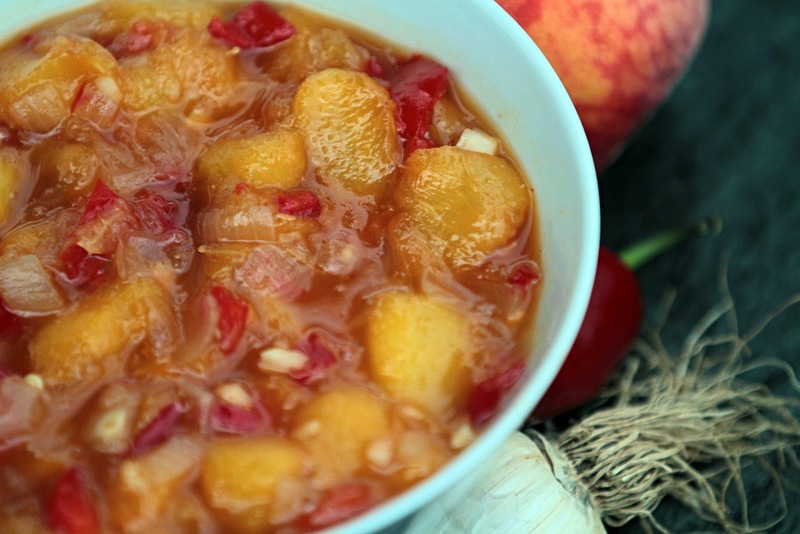 Stir and Continue to simmer until the peaches are tender and the liquid reduces to more syrupy consistency, about 20 minutes. How are you savoring the end of summer fruits? This looks amazing! How nice to have an accompaniment to pork other than apple! I am totally going to make this! Thanks Alicia! Glad you're inspired to try it. I'm saving the leftovers to mix into a sausage hash for breakfast! This looks so good, and I'm trying it with............salmon. Yup you heard right, for some reason I think this will pair well. Can't wait to try it and I'll let you know how mine turns out! Love it. Yes, please let me know! I love peach chutney, but I've never tried to make it myself. Looks great!